The past 2 days have been a whirlwind as so many can relate I'm sure. I'll give a recap of it all, but first I wanted to point out that celebrating All Hallows Eve (aka: Halloween) on October 31 is to celebrating Christmas Eve as celebrating All Saints Day on Nov. 1 is to celebrating Christmas Day! I love learning about and celebrating all the holy men and women who are true role models for our faith and family! Growing up in a Catholic home and attending Catholic school, I never really made the sacred connection between All Hallows Eve and All Saints Day. Now as a mother, I do, and I want to pass this bit of Church history down to my children. Our oldest dressed as a Captain America fan girl and she went out trick or treating with some friends. 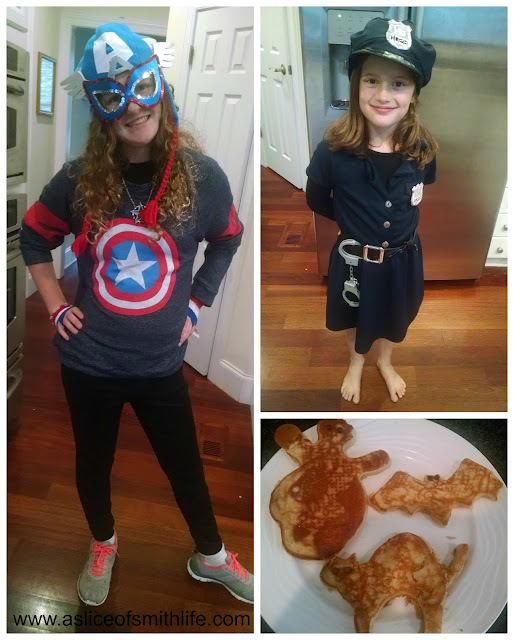 Our 7 year old was a cute cop :) On Halloween morning I made spooky pancakes for breakfast and a friend of mine pointed out that they could be soul cakes! I thought so too! 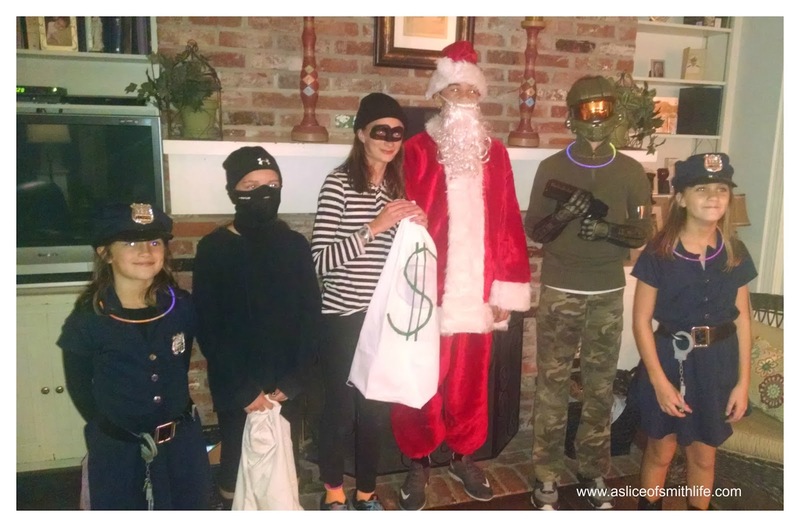 Our other 2 children traveled out of town 2 hours away to each play in a soccer game so as soon as they got home with our friends in the evening, we met them at our friend's house and went trick-or-treating in their neighborhood. In the costume line up we have my daughter as a cute cop, my daughter as a bank robber along with her friend, Santa, my son is a Halo character and another friend as a cop. When collecting the candy loot we saw Elvis singing and entertaining a crowd in his front yard and after the candy collection the friends all set up a "trading post" to swap candy. Oh how that brings back memories! Our 2 year old refused to wear her adorable fairy costume and or get in pictures, but I did manage to take a picture of her sound asleep in her car seat when we finally got home from our fun night. The next day, Nov. 1, was All Saints Day. In the past our homeschool families have met to celebrate this special feast day to recognize and honor (not worship) these holy men and women who have gone before us. As the Dominican Sisters of St. Cecilia explained recently, the Saints should be learned about and become our role models vs. wanting to be like a celebrity. For our All Saints Day gathering I hung up this banner that I made last year from Jessica at Shower of Roses. For this year's All Saints Day party we only had a few families who could attend due to scheduling conflicts and sickness so my son dressed as Saint Maximilian Kolbe and then he and his siblings and friends acted out the story of St. Maxmilian's life while I read his story from the Saints for Young Readers for Every Day, Volume 2: July-December (my FAVORITE Saint books for kids!) 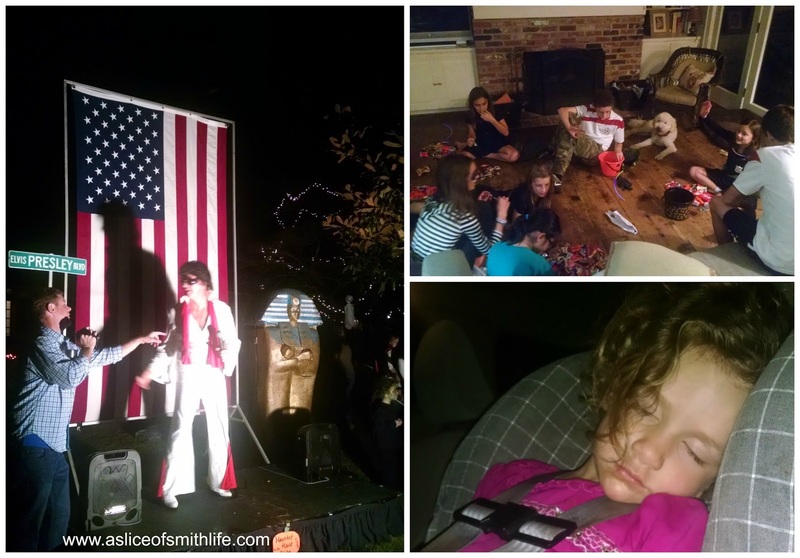 The evening was not only eventful because of the fun that was had, but also one of our moms in our group had to be taken to the ER for chest pains prior to her arriving at our home. She is feeling better (praise God!) and we were able to ask for all the Saints intercession when we prayed the Litany of the Saints. This costume was inspired by Jessica at Shower of Roses when her son also dressed as this inspiring and wonderful Saint. 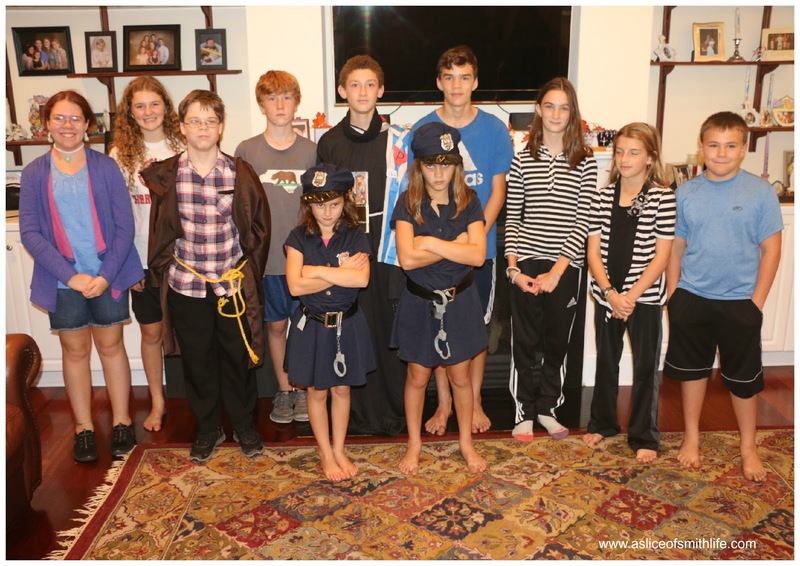 We videoed the great acting skills of everyone and didn't take still shots, but here is St. Maximilian Kolbe with his supporting actors and actresses. From left to right we have 2 prisoners, then St. Maximilian Kolbe, then the father who was chosen as a prisoner and who begged the Nazis not to be taken away from his family (St. Maximilian who had not been picked, felt deeply moved and asked the commander if he could take the place of the father and the guard accepted), then 2 more prisoners and my daughter and her friend were the Nazis in the cop costumes from last night. 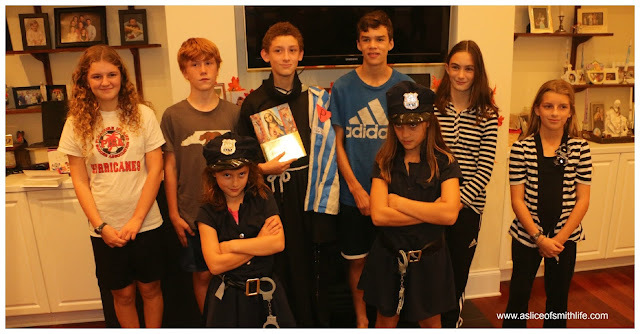 So our "costumes" are on the very simple side, but I'm going to guess the kids will remember St. Maximilian's story and the great love he had to lay down his own life for another. And here our a few more friends that celebrated with us with St. Francis in the crowd as well. Then we prayed the Litany of the Saints lead by one of the fathers and then I played the YouTube video "Litany of the Saints" so everyone could hear the beautiful prayers being sung. And then I played the "Saint Song" which is a fun one where over 100 Saints are song in 2 minutes. Take a listen! After we said the Litany and said grace we enjoyed a potluck meal which included soups and chili recipes. 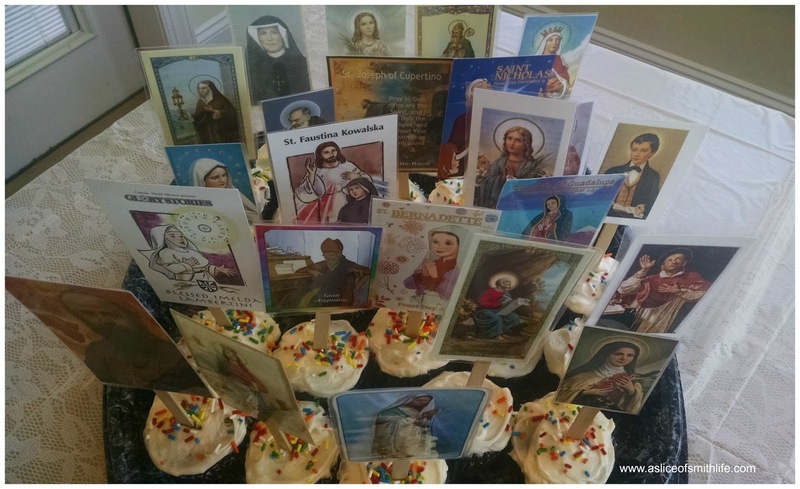 I made my "Communion of Saints" cupcakes again this year with the help of my daughters and inspired by Jennifer at Catholic Inspired. 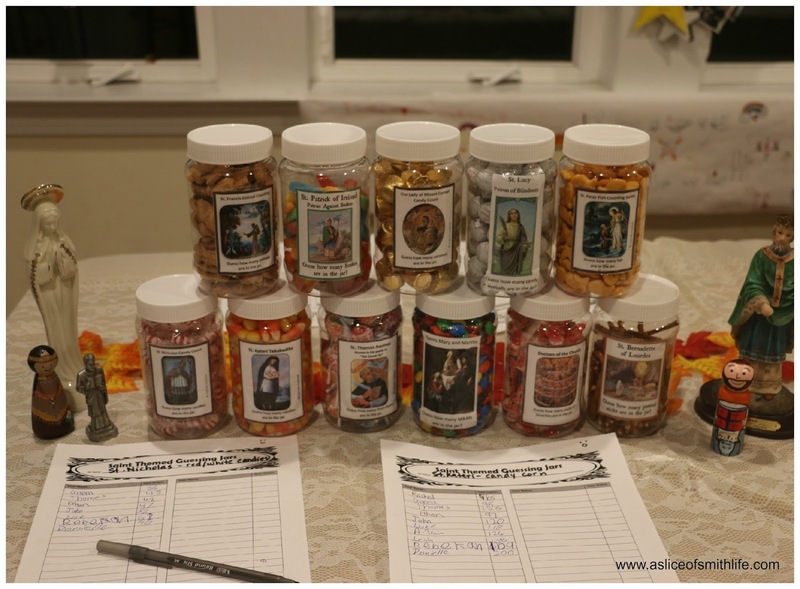 We did the ever popular Saint guessing jars and as each child came to the party they put in their guesses of how many treats were in each jar. Thank you Jennifer at Catholic Inspired and Jessica at Shower of Roses for the ideas and printables to put on the jars. 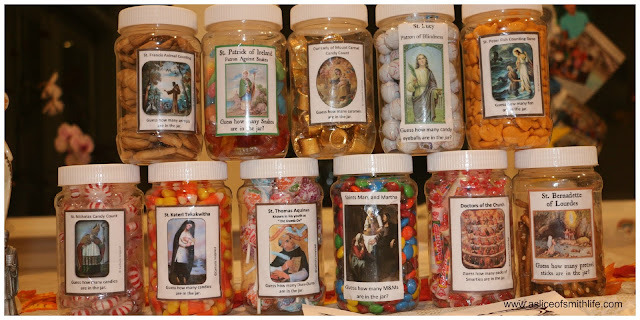 I did make my own St. Lucy and Saints Mary and Martha labels :) I bought my plastic 1 pint mason jars at Oriental Trading. After the guesses were in and the winners announced each winner then acted like a saint and shared their winnings because who needs 509 M & Ms? 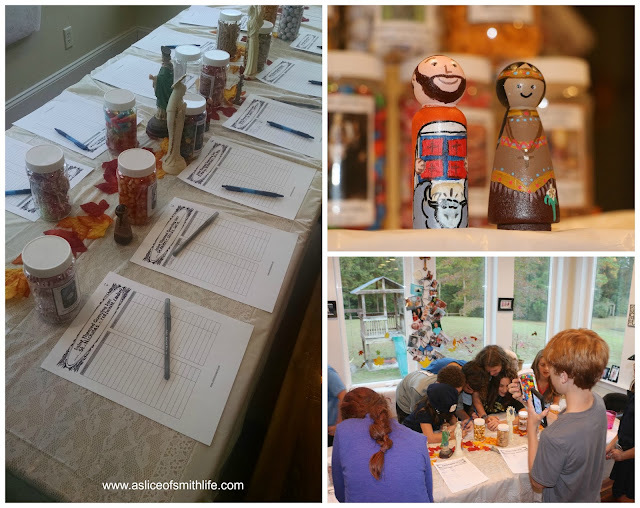 I counted them, I should have won a few myself :) And on the table I put one of the St. Luke and St. Kateri peg dolls that I painted for the Saint peg doll swap I'm in next Sunday. I'm almost done with this fun, but time-consuming project! 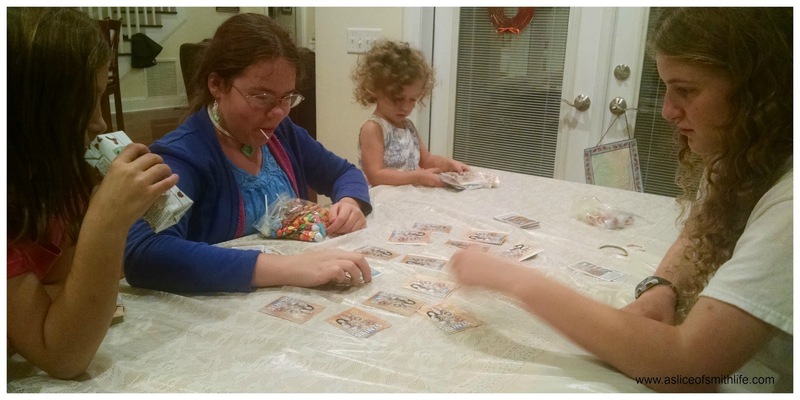 I prepared a few games that a few of the kids played. There was Saint Bingo that I printed and laminated from Jessica at Shower of Roses. 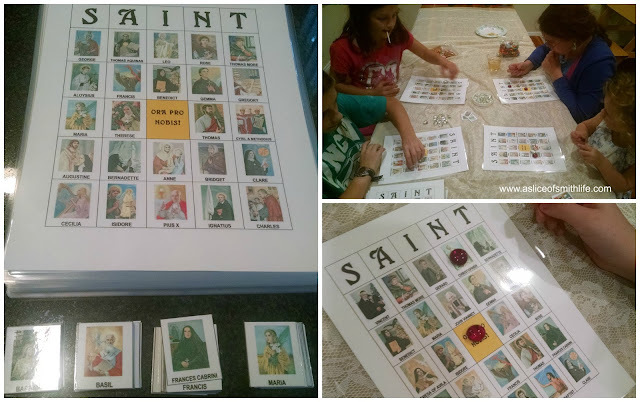 Monica at Equipping Catholic Families has a Super Saints card game that I downloaded and printed off and laminated 2 sets of the 54 cards for a memory matching game. She sells the decks now and I definitely want to put them on my wish list for future gifts for family, friends and Godchildren. 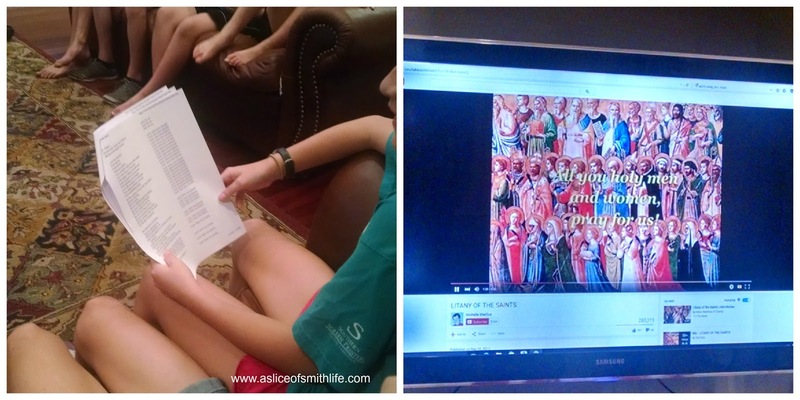 I loved how I could hear the girls chatting about their favorite Saint and sharing information about them! 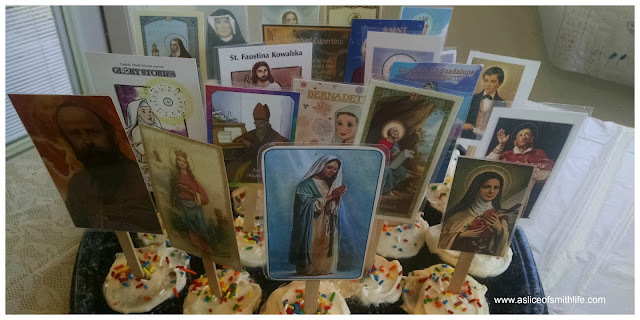 I also printed and laminated Monica at Equipping Catholic Families Saint Script Series THREE and cut the picture of the Saint from the Saint information so the kids could match up the Saint picture with their information. 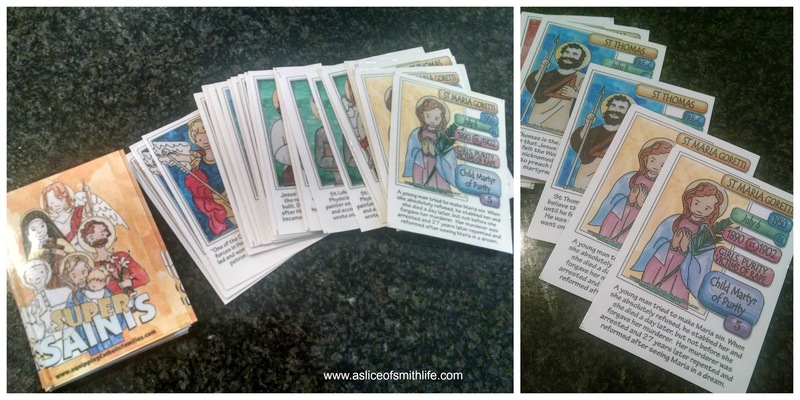 The Super Saints and the Saint Scripts are beautifully drawn and watercolored by Monica and her daughter. So talented and the Saints do come alive through their artwork! These games will be used again and again, especially at future All Saints Day parties! 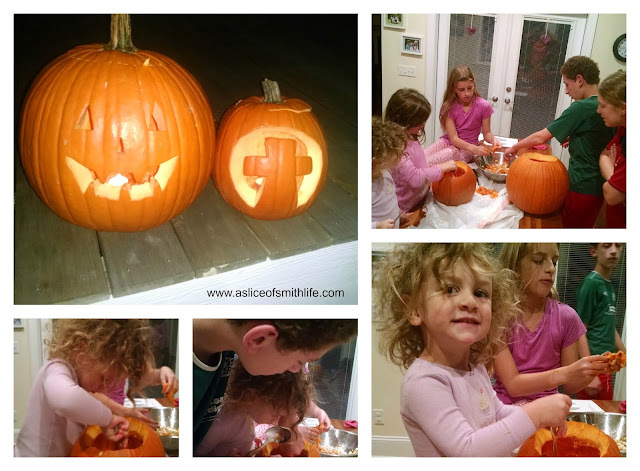 It was a blessed All Hallows Eve and All Saints Day! November 2 is All Souls day where we remember family and friends who have left their earthly home and pray on this day especially for the holy souls in purgatory. 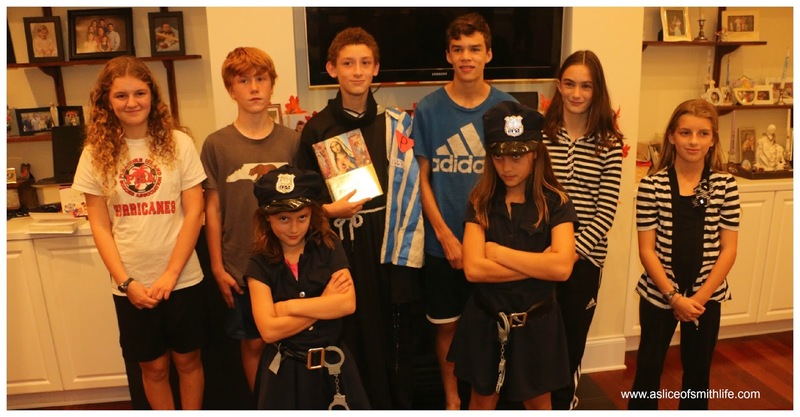 Your Halloween and ASD party look spectacular! What fantastic activities you prepared Your family and the friends who attended were certainly treated to a wonderful AS celebration! The games, costumes, play...YT video. How did you fit it all in? :) And get a post up on it so quickly!? Enjoy reliving the memories through all the pics you took..and catch your breath from the festivities! Right into the school day though, huh? ...no rest for the party planning, HSing mom! Hi Chris! Thank you for all your comments! I stayed up waaaaaaay too late to get the post done, but I wanted to document our weekend ASAP. :). It was certainly an eventful and memorable weekend. I hope you had a blessed All Hallow's Eve and ASD too! Thanks Chris for visiting and commenting! Thanks for linking to my blog! 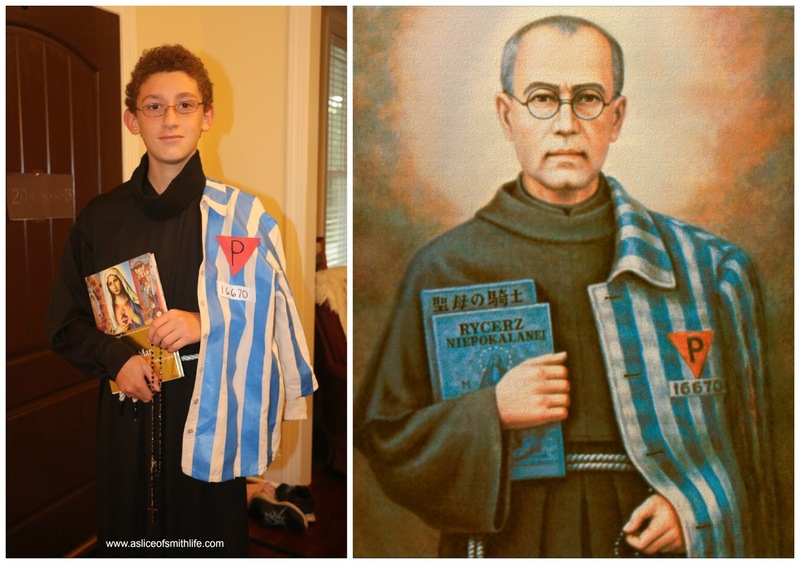 I love your son's St. Maximilian Kolbe Costume! And the Saint song!! Ha! Love it!! As always, thank you for sharing your wonderful,creative, fun and faith-filled ideas! It's always a pleasure to incorporate them into our family's celebrations. Thanks for stopping in and commenting!